Who are the rich? It depends who you ask and when. Since 1992, the IRS has tracked the top 400 earners in terms of adjusted gross income—the so called fortunate 400. Here follows a few highlights from this year’s report, which is based on 2009 returns. Figure 1 shows total adjusted gross income (AGI) for the fortunate 400, in real terms from 1992 to 2009, broken down by major source. Total income has more than doubled, from $29 billion in 1992 to $81 billion in 2009. On a per return basis, income went from $72 million in 1992 to $202 million in 2009. Much of the growth and volatility in real income for top earners has come from capital gains. In the early 1990s, capital gains remained low at about $12 billion (in aggregate), but then climbed to $62 billion in 2000 at the peak of the stock market. They then dropped in half to $31 billion in 2002, peaked again at $96 billion in 2007, and collapsed again to $37 billion in 2009. In every year since 1994, all 400 top earners reported capital gains. The average top earner in 2009 realized $93 million in capital gains, down from $236 million in 2007. In contrast, wages and salaries have remained basically flat, going from $7.5 billion in 1992 to $6.9 billion in 2009. The number of filers reporting wage and salary income declined from 366 in 1992 to 311 in 2009. Per return, wages and salaries have gone nowhere as well, from $20 million in 1992 to $22 million in 2009. The only sustained increase in income has been from pass-through businesses, particularly partnerships and S corporations. This income source quadrupled from $51 billion in 1992 to $198 billion in 2009. Yet the number of filers reporting partnership and S corporation income remained about the same—222 in 1992 and 237 in 2009. This means the average amount reported per return has increased, from $23 million in 1992 to $84 million in 2009. As we have documented before, pass-through businesses have grown tremendously over the last quarter century, such that most business income is now taxed under the individual code rather than the corporate code. Most importantly, this IRS report demonstrates there is a lot of income mobility at the top. Of all the filers who have made the list since 1992, 73 percent were on the list just once. Virtually no one remains on the list for all 18 years, but for privacy concerns the IRS did not report exactly how many did, if any. In last year’s report, just 4 people remained on the list for all 17 years. This suggests that most top earners do not have a portfolio of big investments that can be cashed in year after year, but rather one big asset, such as a family farm or business or stock, the sale of which triggers a capital gain. The fortunate 400 pay more in income taxes than they receive in wages and salaries. This has been the case in every year since 1992 in aggregate and on a per return basis since 1993. 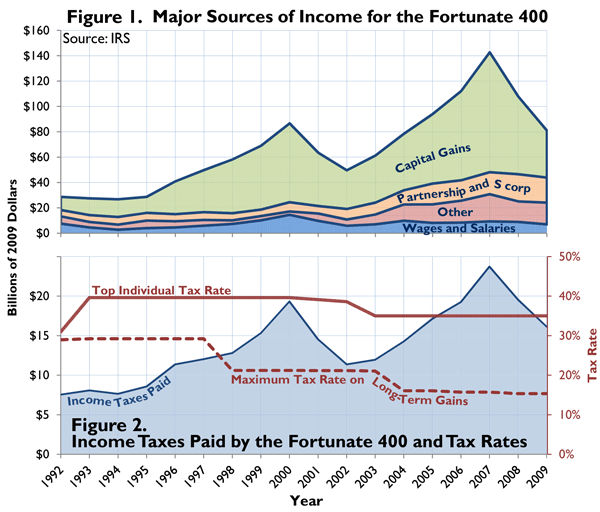 But unlike wages and salaries, taxes have been going up for the fortunate 400. This can be seen in Figure 2, which shows that in real terms taxes doubled from about $8 billion in 1992 to $16 billion in 2009. Interestingly, this massive increase in tax revenue of about $8 billion has coincided with the reduction in both the top marginal rate, from 39.6 to 35 percent, and the capital gains rate, from 28 to 15 percent. Taxes have doubled on a per return basis as well, from $19 million in 1992 to $41 million in 2009. Further, the share of income taxes paid by the fortunate 400 has roughly doubled since the early 1990s, from 1 percent to 1.9 percent. That is only slightly less than the share of taxes paid by the bottom half of income earners (2.3 percent), which represent 69 million filers. For the fortunate 400, the biggest deduction comes from charitable donations. In 2009, 387 of the top 400 filers donated an average of about $16 million per return, or 8 percent of AGI. The number of filers who donate is fairly stable over time, while the amount has generally gone up and down with income. Donations have dropped by nearly half since the peak in 2007. The second biggest deduction is for state taxes, which allows all taxpayers, not just the fortunate, to deduct state income tax or sales tax. All 400 filers claimed this in 2009 for a write off of more than $12 million per return or about 6 percent of AGI. Lastly, the Alternative Minimum Tax is hitting a greater percentage of top earners. In 2009, it affected 124 of the top 400 returns, up from 21 in 1992. Numerous reports have pointed to the growth in high incomes over the last few decades. However, at least among the highest income earners, the fortunate 400, there has been no growth in wages since 1992. Rather, virtually all of the growth is from pass-through business income and capital gains. The volatile nature of this income, particularly capital gains, means that high-flier status is fleeting. Most members of the fortunate 400 remain so for just one year, likely because of the sale of one big asset, such as a family farm, business, or stock. The fortunate 400 pay a lot of income tax—about enough to fund the National Science Foundation and the Department of Interior, which includes the National Park Service. At the peak in 2007, they funded the State Department. Taxes have doubled, in real terms, since 1992. Likewise, the fortunate 400’s share of income taxes paid has doubled to 2 percent—almost the share paid by the bottom 69 million filers. By one definition it is millionaires, which Scott Hodge has discussed in, Who are America’s Millionaires?, Tax Foundation Fiscal Fact No. 317 (June 15, 2012), https://taxfoundation.org/article/who-are-americas-millionaires. Internal Revenue Service, The 400 Individual Income Tax Returns Reporting the Largest Adjusted Gross Incomes Each Year, 1992-2009 (June 2012), http://www.irs.gov/pub/irs-soi/09intop400.pdf. See also Scott Hodge and Alex Raut, Individual Tax Rates Also Impact Business Activity Due to High Number of Pass-Throughs, Tax Foundation Fiscal Fact No. 314 (June 5, 2012), https://taxfoundation.org/article/individual-tax-rates-also-impact-business-activity-due-high-number-pass-throughs. See also Robert Carroll, Income Mobility and the Persistence of Millionaires, 1999 to 2007, Tax Foundation Special Report No. 180 (June 2010), https://taxfoundation.org/article/income-mobility-and-persistence-millionaires-1999-2007. Based on the most recent IRS data. See Tax Foundation, Summary of 2009 Federal Individual Income Tax Data (Oct. 24, 2011), https://taxfoundation.org/article_ns/summary-2009-federal-individual-income-tax-data. Office of Management and Budget, Historical Tables, http://www.whitehouse.gov/omb/budget/Historicals.